The Rested Dog Inn's Front Desk, please check out our facilities. Thanks for dropping in. 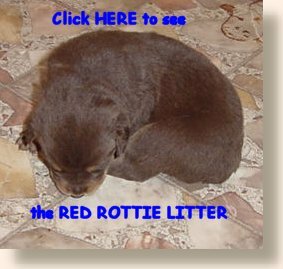 Our site has long been a favourite among Rottie fanciers and has been up since about 1997 in one form or other. Our site is one of the very few Rottie sites where you can see more than just one picture of the in official Rottie circles much balliehoo'd "Red Rottweiler". While we do not own any (nor are we seeking any), with our extensive experience in breeding avian mutations we have a somewhat different, more tolerant view of this mutation. Most "serious" Rottie people are adament about adherence to the written standard, only begrudgingly acknowledging the un-docked Rottweiler as reality, accepting it as something more or less forced upon them by overseas animal rights people and legislation, but don't even attempt to make a reasoned conversation with them about anything other than a black ground colour. It invokes heated, polarized, myopic debate. 'Nuff said. So, welcome to our new home, look around, meet the rott-n family, learn interesting facts about dogs, dog food, have a chuckle or two with our doggie humour and once you're done or two or, better yet, why don't you sign our guestbook before you leave. I can tell from the counter statistics that we have been visited from an ever growing list of far-away places, such as Andorra, Antigua and Barbuda, Argentina, Aruba, Australia, Austria, Belgium, Bermuda, Bolivia, Bosnia and Herzegovina, Bhutan, Brazil, Bulgaria, Chile, China, Cocos Islands, Colombia, Costa Rica, Croatia, Cuba, Cyprus, Czech Republic, Denmark, Dominican Republic, Ecuador, Egypt, El Salvador, Estonia, Finland, France, Germany, Georgia, Gibraltar, Greece, Guatemala, Guernsey, Hong Kong, Hungary, Iceland, India, Indonesia, Ireland, Israel, Italy, Japan, Jordan, Kenya, Kuwait, Latvia, Lebanon, Lithuania, Luxembourg, Macedonia, Malaysia, Mauritius, Mexico, the Netherlands, New Zealand, Nigeria, Niue, Norway, Oman, Pakistan, Paraguay, Peru, Philippines, Poland, Portugal, Romania, Russian Federation, Saudi Arabia, Singapore, Slovak Republic, Slovenia, South Africa, South Korea, Spain, St Helena, Sweden, Switzerland, Taiwan, Thailand, Togo, Tonga, Trinidad, Tobago, Turkey, Tuvalu, Ukraine, the United Arab Emirates, the UK, Uruguay, Venezuela, Yugoslavia and Zambia. Oh, and the US military, including the Pentagon, who visited way back on September 17th 1999 at 4.02, and the US government: time to get paranoid or just some federal employees putting tax dollars to good use??? Actually, now that we have much more detailed stats available for our site traffic it becomes quite clear that a fair number of people surf at work; we can see that by the traffic we get from .gov, .com, .edu and .org addresses. Where-ever you access our site however, we'd love to hear from you and welcome your comments and suggestions, . This is a copyrighted© animation, please have the courtesy to ask permission before you "borrow" this animated GIF. Web Pages Created by Pieter Klapwijk.